I don’t often make Chilean Sea Bass because it’s $29.99 a pound price tag, but when I do there are freakin fireworks! It’s never bad, but there does come responsibility with sea bass. It’s a very overfished fish and always isn’t the most sustainable so if you are going to purchase it, make sure it’s during a sustainable period. If you are all about keeping the current ocean ecosystems preserved then halibut will do just fine in this dish. 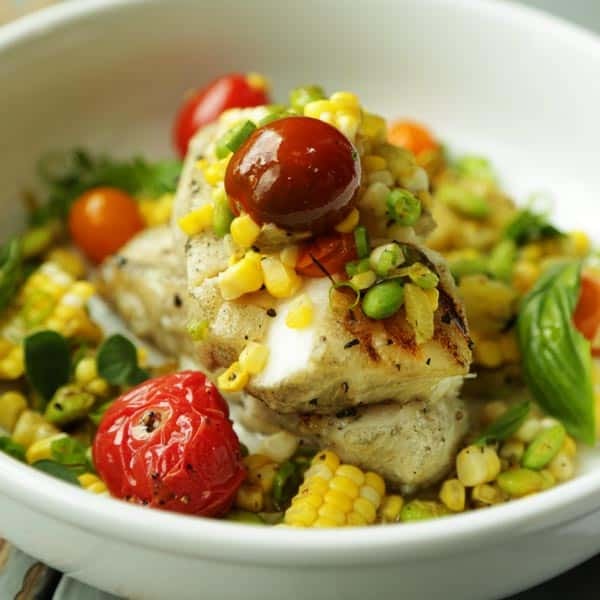 I had a lot of fun creating this Grilled Sea Bass and Corn Salsa Recipe with Hatch Chiles because I got to work ingredients I rarely do in hatch chiles and sea bass. Hatch chiles are only in season for a short period of time towards the end of summer. If you are looking for another recipe with hatch chiles cause you don’t like sea food then check out this Grilled Chicken Recipe with Hatch Chile Chimichurri Sauce. Try this delicious and easy to make Grilled Sea Bass and Corn Salsa Recipe with Hatch Chiles. Roast up some Hatch Chiles while they're in season! Vegetables: In a bowl coat the peppers, tomatoes and edamame with 2 tablespoons of olive oil and season with salt and pepper. Next, place the un-shucked corn on a hot grill along with the hatch peppers. Place the tomatoes and edamame in a grill approved metal basket. Cook all of the vegetables until the corn begins to char black and the peppers are black roasted on all sides (about 15 minutes). Once the veggies are cooked, remove from the heat and add to a bowl. Once the corn has cooled, shuck it and trim the corn from ear. Add it to a bowl along with the grilled edamame and tomatoes. Scrape the char off the peppers, seed them and chop them. Add them to the bowl with vegetables and season with salt and pepper. Coat the sea bass with 1 tablespoon of olive oil, season with salt and pepper and grill on high heat until marked and cooked through, about 12 minutes. Serve the vegetables with the grilled sea bass and garnish with green onions and fresh herbs. Thank you for mentioning Hatch Green Chile! We would love to send you a free box of our Hatch Green Chile as a thank you. If you’re interested, please send me an email.